SKU: 100806 Category: DVDs Brands: Derder. * There are ten professional paintball events each year in the U.S. With over 20 teams competing, the best of the best constantly train and practice to keep their edge. Their dedication and stamina are tested as the year grows to an exhausting level. * The playing field becomes a battlefield testing their ability to rise above the elements. The team with less drive and talent will fail. Only those with the resources and determination to succeed are able to win this. 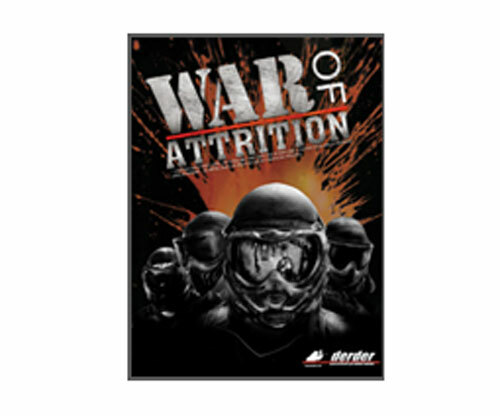 * War of Attrition. Controversy, frustration and triumph. Xball and 7 man. Der Der Productions followed some of the top teams for the entire season to assemble a brutally honest visualization of tournament paintball.